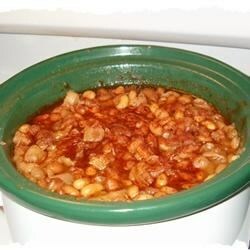 "A good, homemade recipe for baked beans. Serve with your favorite entree, or as a meal in itself." In a large pot over high heat, combine the beans with water to cover and bring to a boil for 10 minutes. Remove from heat but let sit for 1 hour. Drain beans and place them in a slow cooker. Add the ham hocks, onion, brown sugar, maple syrup, salt and water. Mix well, cover and cook on high setting for 4 to 5 hours, stirring occasionally. During the final hour of cooking, add the ketchup and mustard, remove the ham from the hocks and discard the hocks. Mix well and serve. Wow, this was so delicious. Really wonderful, and made my house smell so homey. I served it with corn muffins.